An Abdominal Aortic Aneurysm (AAA) is a potentially life-threatening diagnosis. AAA is a weakened area in the abdominal aorta which is the largest artery in the human body, coursing from the heart to the pelvis, and AAA usually discovered in the abdomen below the kidney arteries. Blood flows through the aorta to all parts of the body, and an aneurysm is a weakened portion of the aortic wall, causing the aorta to enlarge in size. Predictors of AAA rupture are increasing AAA size, symptoms like low back pain, or erosions in the wall of the aorta at the AAA site. Once an abdominal aortic aneurysm is diagnosed, doctors will carefully monitor it so that surgery can be planned if it becomes necessary. Since the aorta is the body’s main supplier of blood, a ruptured abdominal aortic aneurysm can trigger fatal internal bleeding. In the last 30 years, the occurrence of Abdominal Aortic Aneurysm has increased threefold. When an aneurysm grows to 5 centimeters in diameter, it is generally considered necessary to treat in order to prevent a rupture. Smaller than 5 centimeters, the risk of the aneurysm rupturing is lower than the risk of conventional surgery in patients with normal surgical risk factors. The goal is to prevent the aneurysm from rupturing. After an AAA has ruptured, the chances of survival are very low, with 80 to 90 percent of all ruptured aneurysms causing death. These fatalities can be prevented if an AAA is discovered and treated before it ruptures. Men are four times more likely to have Abdominal Aortic Aneurysm than women. Abdominal Aortic Aneurysm affects more than seven percent of people over the age of 65. People at the highest risk are men over the age of 60 who have smoked and/or who have a history of atherosclerosis. If you have a family history of Abdominal Aortic Aneurysm you are at a higher risk; especially if the relative with AAA was female. Smokers die four times more frequently from ruptured aneurysms than nonsmokers. Abdominal pain that may be intermittent or constant. Pain in the lower back that may spread to the groin, buttocks or legs. The sensation of a pulse in the abdomen area. Severe back or abdominal pain that starts suddenly. Dry mouth/skin and extreme thirst. 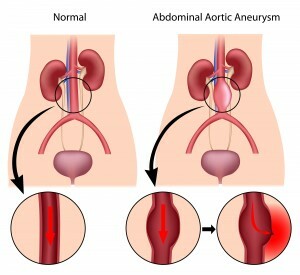 In some cases, an Abdominal Aortic Aneurysm can be diagnosed by a physical examination where the doctor can feel the aneurysm as a soft mass in the abdomen at about the level of the belly button, and it pulses with each heartbeat. Generally, an Abdominal Aortic Aneurysm is diagnosed by the use of an ultrasound machine. Other methods for establishing the aneurysm’s size, are by either arteriogram (real-time X-rays), CT scan (computerized tomography) and MRI (magnetic resonance imaging). AAAs that are less than 5 centimeters or about 2 inches, that are not quickly growing or triggering symptoms, have a low occurrence of rupture and often require no treatment other than monitoring under the guidance of a vascular disease cardiologist. This usually includes follow-up ultrasound exams at regular periods to establish if the aneurysm has grown. Traditional Abdominal Aortic Aneurysm repair is an open-abdomen or open-chest surgery and is performed by a vascular surgeon. This surgery requires an incision from just below the breastbone to the top of the pubic bone. The surgeon then closes off the aorta, cuts open the weakened aneurysm segment of the aorta and sews in a graft to act as a bridge for the blood flow. The remaining aortic end-pieces are reattached to the graft. When the aorta is repaired, the surgeon removes the clamps so that blood can flow through the aorta again. Afterward the doctor uses stitches or staples to close the incision in the abdomen. Now the blood flow goes through the graft and no longer permits the direct pulsation pressure of the blood to continue expand to the weakened aorta wall. Surgical repair for an Abdominal Aortic Aneurysm is performed in the operating room under general anesthesia. Another option is a minimally invasive technique call endovascular aortic repair or EndoGrafting that is performed by First Coast Heart & Vascular Center’s interventional cardiologists utilizing imaging to guide insertion of a stent graft inside the aneurysm. This method redirects blood flow through a covered stent placed inside the aneurysm, excluding the enlarged portion. This prevents direct pressure from being placed on the weak aortic wall. During the procedure, an incision is made at the groin through which a catheter is moved into the femoral artery and guided to the aortic aneurysm. Through the catheter, the interventional cardiologist passes a stent graft that is compacted into a small diameter size within the catheter. After the catheter has been positioned in the correct location, the stent graft is discharged from the delivery catheter, which is then removed. The stent graft remains in place creating new walls in the blood vessel and permits blood to flow through the stent, entirely bypassing the aneurysm, and thus substantially reducing the risk of rupture. This relatively new technique eliminates the requirement for a large abdominal incision and avoids surgical complications associated with wounds, bowel dysfunction. It also eliminates clamping the aorta during the procedure. AAA endografting with a stent graft has surpassed open surgical open aortic repair as the preferred method of AAA management in the modern era. This technology is also limited by size. The stent grafts are only made in specific sizes, and the patient’s anatomy must be able to fit the graft because the grafts are not custom made for each patient. Imaging with CT scanning is required for AAA sizing. Interventional repair of an Abdominal Aortic Aneurysm is a safe and effective procedure, resulting in lower morbidity and lower mortality rates than those associated with an open surgical repair. Most patients are discharged the day after the interventional repair, and usually do not require an intensive care or a prolonged stay post-op. Once discharged, most patient return to normal activity within one week compared to six to eight weeks after a traditional surgical repair. Faster recovery and less time in the hospital. Sutures only at the groin. In some cases no general anesthesia is needed. Potential for movement of the graft after the procedure, with blood flow into the aneurysm and resumption of risk for rupture of the aneurysm. Probable life-time requirement for follow-up visits and imaging to ensure the stent graft is continuing to function properly.